Kurds in northern Iraq have been commemorating the 25th anniversary of the chemical weapons attack on the town of Halabja by Saddam Hussein's forces. 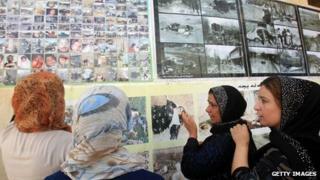 Clutching photos of dead relatives, mourners observed a minute's silence at the Martyr's Monument in Halabja. An estimated 5,000 people, mostly women and children, were killed when Iraqi jets dropped poison gas on the town. Many others died later of cancer and other illnesses, and the legacy of chemical contamination persists. The attack on Halabja on 16 March 1988 was the most notorious act of chemical warfare in modern times, the BBC's Jim Muir in Baghdad says. Iraqi government forces attacked the town near the Iranian border after it was taken over by Kurdish rebels towards the end of the Iran-Iraq war. The exact number killed is not known, but ran into the thousands as townspeople choked on a mixture of mustard gas and nerve agents. Researchers believe the contamination passed not only into the soil and water, but also into the gene pool, with abnormal numbers of children since being born with genetic malformations. In a speech marking the anniversary, the regional prime minister of Iraqi Kurdistan, Nechirvan Barzani, called for 16 March to be recognised as an international day against chemical weapons, the AFP news agency reports. The atrocity at Halabja scarred the collective memory of Iraqi Kurds and hardened their determination to run their own affairs autonomously within a loose Iraqi federation, our correspondent says. The two men directly responsible - Saddam Hussein and his cousin Ali Hassan al-Majid - known as "Chemical Ali" - were hanged in 2006 and 2010. The attack on Halabja was part of a wider campaign known as "Anfal" in which tens of thousands of Iraqis were killed by their own government.